This was our last stop when we were riding the “Yeat’s trail”. It was magnificent from the out side and as beautifull from inside. Breakfast was perfect. Room were clean and very big with information about restaurants near by. My family and I have been using Yeats Lodge as our base for our annual long weekend break in Sligo for a number of years now and we love it! Then setting just outside Drumcliffe is beautiful with stunning views of Ben Bulben. All the rooms are spacious and comfortable and Geraldine is a wonderful welcoming host who provides a wonderful breakfast for us Yeats Lodge feels like going home year on year. 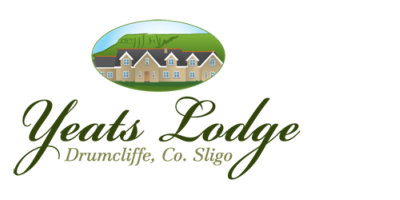 If you want a comfortable base to explore the glorious Sligo countryside Yeats Lodge is hard to beat. And I haven’t mentioned the nearby Yeats Tavern, where you can eat yourself to a standstill in lovely surroundings just a short walk away!